When Mike Ekeler was playing linebacker at Kansas State University under Hall of Fame coach Bill Snyder in the early 90s, he set a record. But you won’t find his name scribbled in the NCAA history books anywhere. He seems to be living up to his promise. Ekeler’s antics have caused just about everyone to take notice — including his boss. Head coach Seth Littrell knows the excitement Ekeler brings to the field and summed it up in two words. Without Littrell, Ekeler would not have come to Denton. 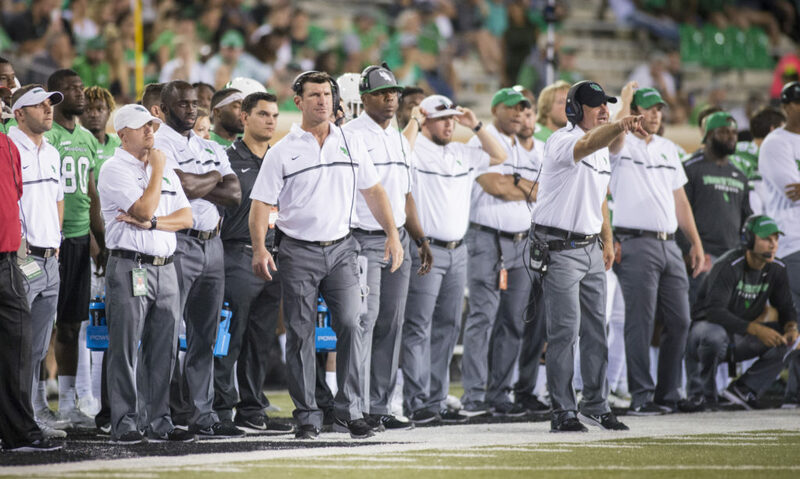 The hiring of Littrell is one of the main reasons Ekeler decided to call North Texas his new home. With a resume that has coaching gigs at the University of Southern California, University of Oklahoma, Louisiana State University, Indiana University, Nebraska University, and most recently, the University of Georgia, there is little doubt Ekeler could have landed just about anywhere in the country he wanted to go. But coaching is a job for a people person, and Littrell knew just the person to call to fill his defensive coordinator void. 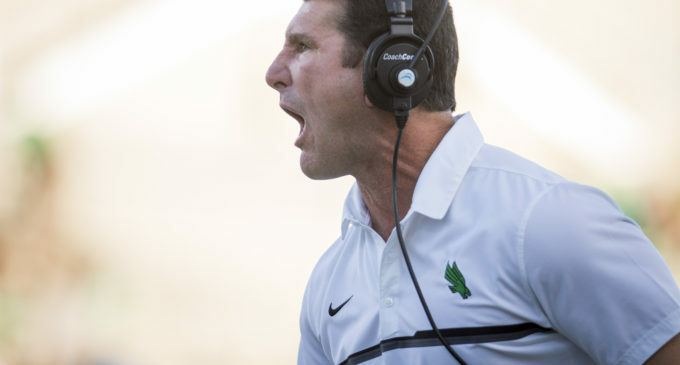 His former colleague was sold — and ready to join the Mean Green. In just six short weeks, Ekeler has turned what was the eighth-worst defense in the Football Bowl Subdivision last year into a stone wall in the red zone. The Mean Green rank 79th in total defense in the FBS, with opponents averaging 418.8 yards per game. Compared to 2015, the Mean Green defense has cut its opponent’s points per game total almost in half. 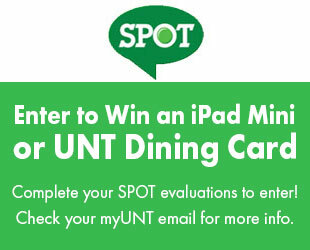 But the red zone is where North Texas shines. Inside the 20-yard line, the Mean Green are tied for 38th in the country with Duke University, Appalachian State University and No. 7 Louisville in red zone defense. The energy Ekeler brings to the defense is a big part of the turnaround. And the players feed off it. At the same time, Ekeler gets his buzz from his players. While relationships and fun are a massive part of coaching, Ekeler does not let that get in the way of what he hopes to accomplish, which is teaching his players. Most of his fun comes from watching his players grasp a new concept. In six games this season, junior defensive back Kishawn McClain has run rampant, setting a new career high in interceptions with three. He is also tied for the team lead in tackles with 41. Part of that is thanks to Ekeler focusing on the fundamentals. Relationships are important to Ekeler, and the relationships he has built in his short time in Denton have helped in the overhaul of football culture at the university. And even though having fun and winning are his top priorities, Ekeler ultimately knows what all of his players need.